Normally, the lead photo art corresponds with the lead review, but protocol be damned when you hook a whopper like this: a candid shot of Ingmar Bergman posing with Spielberg’s toy shark, Bruce. To commemorate the 100-year anniversary of the birth of Woody Allen’s favorite director, the Ken Cinema will hold a one-week retrospective of seven of the Master’s most enduring titles. Films to be screened include Hour of the Wolf, Persona, The Seventh Seal, The Virgin Spring, Wild Strawberries, Cries and Whispers, and a special presentation of Smiles of a Summer Night that includes a complimentary reception hosted by the Consulate of Sweden San Diego and the Swedish Center. The centennial celebration will be held on Tuesday, July 17 between 5-7 p.m. at the Kensington Brewery. It will be my pleasure to join Consul Britta Armstrong when we introduce the 7:10 screening of SOASN. Short of the extremely long Fanny and Alexander, there isn’t a better Bergman film for celebrating the occasion than Summer Night. How might the The Virgin Spring or Cries and Whispers play after a couple of cocktails? Don’t ask! For tickets and showtimes for the rest of the series, visit the Ken's website. At a point in our history when a president brazenly enforces a law to separate parent from child in the name of national security comes a film about Tom (Thomasin McKenzie), a 13-year-old girl who wants nothing more than to live her life apart from her asocial father Will (Ben Foster). 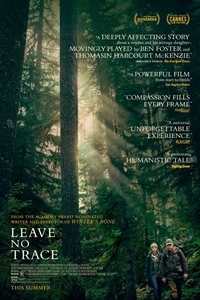 Don’t let the title fool you: Leave No Trace will make an everlasting impression on all who see it. One color dominates the first half hour of the film; it’s green as far as the eye can see. 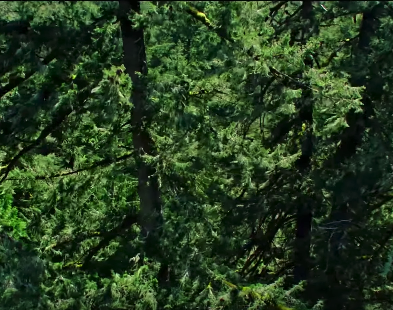 From a distance, Will and Tom appear to be a pair of father-daughter survivalists on a weekend camping trip, when actually this lush Oregon jungle is their backyard palace. Tom has spent a portion of her life being raised without a roof over her head, but later acts surprised when someone refers to her as homeless. Will and Tom are homeless by choice, due in large part to the emotionally crippling time Dad spent serving his country. Nights are spent literally trying to stave the wolves from their zippered-tent door, but for the most part, the two seem to enjoy living off the unspoiled surroundings. A trip into town to stock up on provisions and visit the local VA gives us our first glimpse of Tom and Will interacting with others. Normally, if you see a gunlock in Act I, the cord will be pulled in Act III, but at its core, Leave No Trace follows a peaceful path where the resolution to life’s roadblocks isn’t found in a bullet. The only crime Will is guilty of is selling his meds to a fellow fringe-dwelling vet. It’s probably the easiest of the many difficult decisions he is asked to make. From Tom’s perspective, her dad’s paranoid streak runs a mile wide. Not wanting to be discovered, Will regularly holds impromptu drills, rehearsing in dread for that determinative moment when a work crew might accidentally spot Tom trying to catch a glimpse of them. That’s exactly what happens when Tom’s curiosity about life in the forbidden zone gets the best of her. Social workers are shocked to discover that a child with no formal education is so far ahead of other students her age. Dad’s home schooling — or in Tom’s case, homeless schooling — taught her everything except social skills. In his mind, Will’s punishment is the American dream: a house in the suburbs. The first thing Will does after they move in is stow the TV in a closet. His is not a world of hampers and toaster ovens. Tree-lined wallpaper and dead animal heads mounted as trophies seem to mock him. In exchange for the accommodations, Will works as one of Santa’s lumberjacks, chopping and grooming Christmas trees. Wooded areas that once provided overhead shelter become his office and main source of income. For a long time, Will feared the day that he and Tom would be separated due to his refusal to play by the rules. For awhile he gives it the old college try, even attending church on Sunday — not for any spiritual guidance, but rather as a way of fitting in with the community and thus warding off questions from nosy neighbors. But once Tom gets so much as the slightest taste of civilization, there is no turning back. So conditioned am I by Hollywood’s pat transitional devices that I half expect to see a demon’s face glowering back at me every time a character closes a medicine cabinet. Happily, no trace of monsters was found on the call sheet. If anything, it does a heart good to see a movie about decent people. Tom had become used to having to cover for her dad when strangers started asking questions. Before allowing them to hitch a ride on his big rig, a trucker pulls her aside to inquire as to the child’s safety. Only when it’s made clear that Will is her father, not her captor, does the driver agree to give them safe passage. The secondary characters aren’t driven by pity or snoopiness any more than they are motivated by scorn. They’re just not looking to avail their services to someone who’ll leave them guilty by association. Writer/director Debra Granik (Winter’s Bone) never hammers the PTSD; it has become a character attribute familiar to even the most casual filmgoer. And Foster is no stranger to this type of wounded warrior, having played a variation on Will in the equally disquieting, The Messenger. How difficult must it be for a parent to hear his daughter reassure him that there is nothing to be afraid of? As a father forced to make the hardest decision of his life, Foster allows tones of quiet defiance to outshout Will’s inner-anger. It takes some doing for Tom to finally confront Will with, “The same thing that’s wrong with you isn’t wrong with me.” Allow me to be the umpteenth critic to proclaim McKenzie an actress to watch. Never out of the moment, hers is the textbook definition of a star-making performance. At about the halfway point, an idea of what the last shot was going to look like began to form in my head. Sometimes I hate being right. Debra Granik directs with a touch that’s as gentle on the audience as bees are to Tom. There is not a move, cut, sound, or deliberate stretch of silence that in some way doesn’t advance and inform the plot. Oscar will remember this movie. See it now and avoid the unavoidably packed year-end “For your consideration” screenings. Aug. 20, 2018 @ 1:16 p.m.
Well yes, the world is celebrating the centennial of Ingmar Bergman. The Mexican theater chain, Cinemex, for example is running one of his films every two Saturdays or one Saturday a month from July through October. Went to see SMILES OF A SUMMER NIGHT at the Ken. Not bad, but it didn't attract me either. Two weeks later I saw THE HOUR OF THE WOLF at a Cinemex theater. I was disappointed. Good acting, though. I had only seen it once before and that was on VHS back when Hollywood Video was still around circa 2006 or 2007. Funny thing about Bergman. When I first saw THE SILENCE, it was a four-star movie for me. After a second viewing, it went down to three stars. I hope the same doesn't happen with WINTER LIGHT which for me is one of the ten best films I've seen. As to my brief chat with Mr. Marks, Bu~uel a "misogynist"??? You mean an Atheist Marxist a misogynist??? Aug. 21, 2018 @ 7:30 a.m. It's been a little over a month since SOASN screened and I'm finally getting feeling back in my legs. For me, Kubrick and Bergman will forever be the Deans of the Academy of the Overrated. Aug. 21, 2018 @ 9:21 a.m.
Maybe Antonioni is a close second. Aug. 21, 2018 @ 4:48 p.m.
Aug. 21, 2018 @ 8:44 p.m. Didn't see that one. "Zabriskie Point" wasn't that great. Aug. 21, 2018 @ 10:51 p.m.
First off, allow me to apologize for Antonini. By way of penance, enjoy this clip. If only Mel was the star of ZP. He'd have blown up good. Real good! Aug. 22, 2018 @ 9:45 a.m. Thanks for the clip; I never saw that deadend interview before, although I always liked the erudite Cavett. He was Carson + brains. And I caught your sly reference to "Blow-up" (which I did like). Aug. 22, 2018 @ 11:31 a.m.